Isn’t it amazing how much the kids change between 2 and 4 years of age? They move from scribbling to drawing with a purpose – from messy circles to people, buildings, animals, and basically anything they see around themselves. Their imagination is running wild and so are their artworks. Every art is accompanied by a story that just keeps going and going… Their pictures are filled with tons of symbols and hidden meanings (and even though these are often difficult for adults to understand, they make sense and are very important). 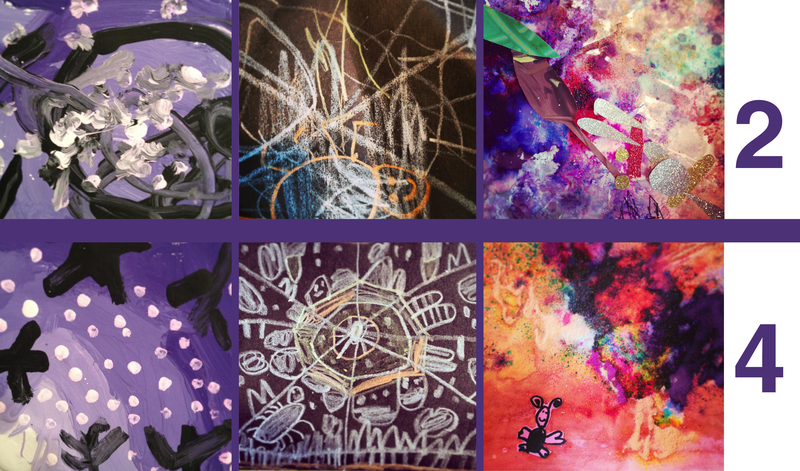 These paintings were done by a 2-year old and a 4-year old – at the same time, following the same instructions. There is a monochromatic night sky with snow, a metallic-crayon spider web (a project my son insisted on drawing this weekend), and butterfly/dragonfly collage on a dry-powder-watercolor-treated paper. This entry was posted in Art Education, Art Projects and tagged 2, 4, art, ArTree, kids, magazine, monochromatic, project, watercolors. Bookmark the permalink.